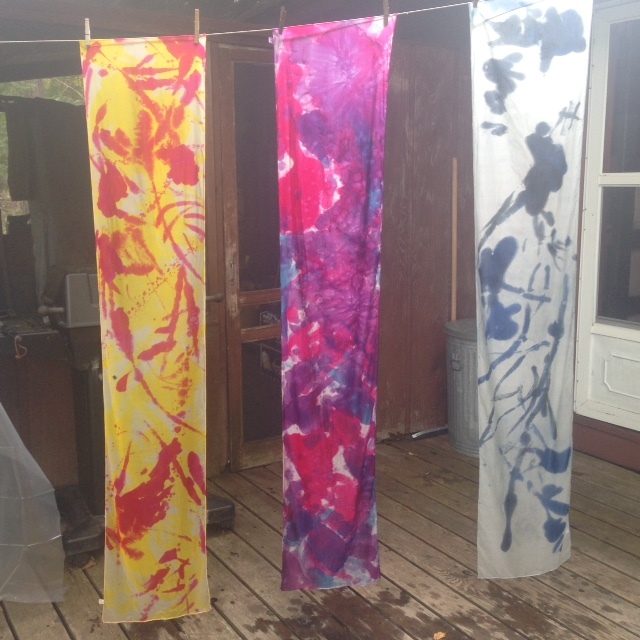 I got into the scarf painting business by accident! For 25 years I used a different brand and type of fabric paint. It was a medium bodied acrylic that was set into the fabric with an iron. I loved it, it worked great for me I was happy. Earlier this summer, I stopped at Wet Paint in St. Paul, and found out that the brand I had been using for 25 years, had relied on, was discontinued. I was devastated. All of a sudden, a extremely helpful sales person asked if I needed help. I explained my issue and he said, "wait a minute, I'll be right back!" A very happy customer! She couldn't decide, so she bought two! He then said, "Come with me," and brought me to a good sized wire rack that held the entire line of Jaquard silk dyes. This line was still being made, but they were closing it out. They gave me a special price if I agreed to take everything, rack and all! Later that day, I was at my friend Mike's house and suddenly remembered that "The Rack" was still in my van. I said, "Hey, Mike!, do you want to help me paint on a scarf? I explained that I had just procured a new system and medium for painting on silk--but this time, the silk was different, the paints were dyes and I was unsure. However, We had instant success, and our first scarf was a masterpiece! From there, we just keep going and support each other to stay on track with production. WE HAVE FUN MAKING THEM! We love "Doing Your Colors." It's fun, it's challenging, and because Mike knows when to stop, we have a stellar success rate. The "Mary Kay!" 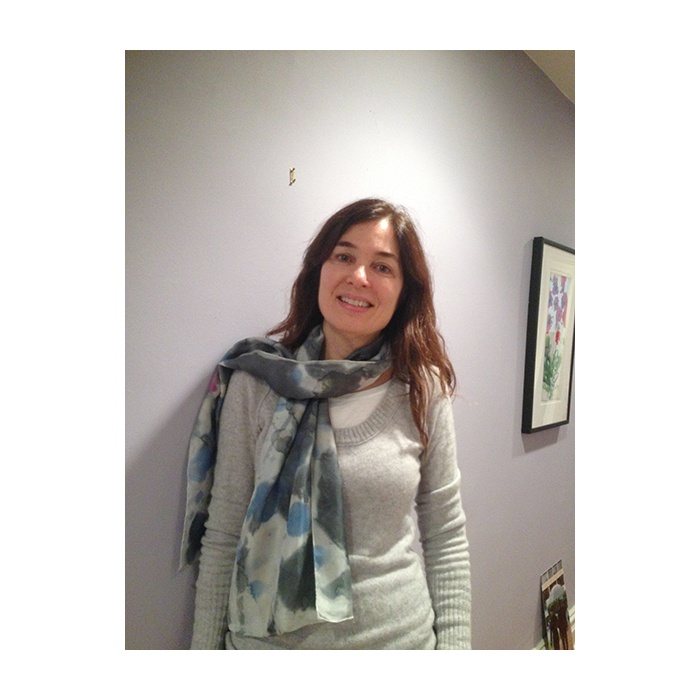 This gorgeous scarf goes perfectly with her new purple cashmere sweater and a favorite hot pink silk blouse! Yum, yum!!! Here's what Janice had to say about her scarf called "Black & Blue:"
Michael, the last thing I did last night and the first thing I did this morning was to put on my scarf! It really is intriguing and makes every outfit more sophisticated... And I will tell everyone where it came from and that there are others available. Thank you so much, and I hope that you have a lot of success with the scarves. Scarves! Fresh out of the dye set—waiting to be washed in Woolite and pressed. 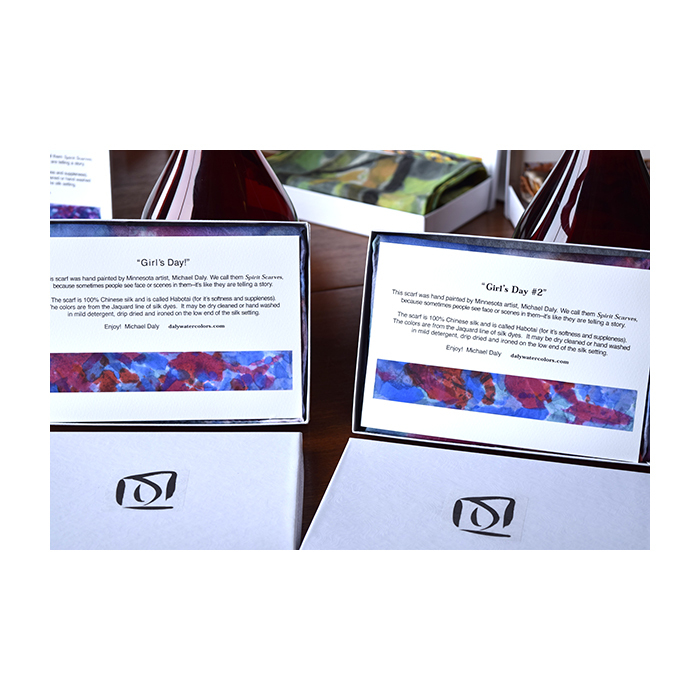 Another sample of how you will receive your beautiful scarf. You're invited to a "Co-ed Party!" Wonderful Rob! I hooked Rob & his husband, Mikko, with the scarf called "Fishes." It's a gift for Rob's cousin, Marta. She's going to flip out with excitement when she see this gorgeous wonder. Marta loves Michael Daly and his art! 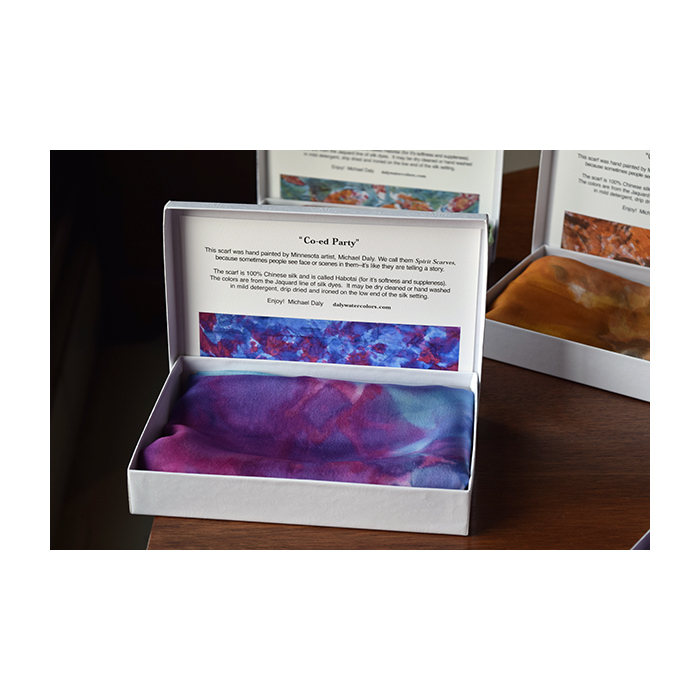 All of our silk scarves come in a beautiful white "Keepsake" box, which includes a luxurious card with the title, a photo of your scarf, definition of what a "Spirit Scarf" is, and washing instructions. "Girl's Day" & "Girl's Day #2" From our Mother/Daughter series. Nobody can explain it, but there seems to be SPIRITS in these scarves! We can't keep them in stock, so if you see one where the "spirits" are relating to you, then buy it! Thank you for supporting the new business and giving us the courage to continue on!